I cut back to watering my tomatoes only once a week, and can you believe it–they started to ripen. We also had a long stretch of hot weather, and it’s already a month later than usual, so I don’t know if the watering was the magic or not. 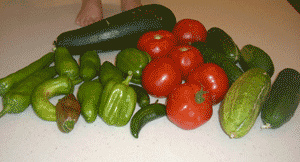 Here is my haul–peppers (New Mexico Big Jim’s, bell, and jalapeno), zucchini, tomatoes, and cucumbers. I pretty regularly pick one or two cucumbers a week, but these are ALL the tomatoes and peppers I’ve gotten so far. Pretty soon I’ll have enough for fresh salsa! Great Emily! Your veggies are doing wonderfully! What am I doing wrong with my cucumbers? I only have one plant and it is growing little yellow flowers, lots of them, but I haven’t gotten one cucumber. I asked my garden center about reducing the water and they told me that it takes 10 days once you have stressed the plants with reduced water to see the change. On the other hand my heirlooms are still getting water everyday while my early girls are getting half that and they are only about 2 weeks apart on ripening (and the heirlooms take longer to mature anyway). So who knows. 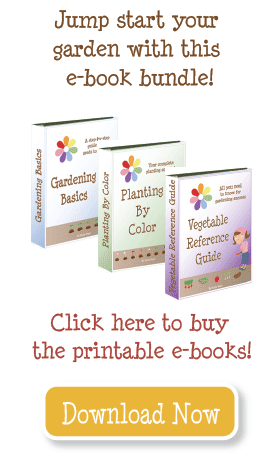 Have you ever posted your link to your harvest on Harvest Monday at Daphne’s Dandelions? It’s a fun group and they share seeds too!